Sunday we picked Darlene and her family up for church. Right before sacrament started, I looked over at Darlene and she is bouncing in her seat smiling so much and just kept saying, "I'm so excited!" We are so looking forward to her baptism. We are going over to her house this evening to give all her little kids their Christmas presents from the Ward :) I love them. We also had a small little gift exchange at the VC with all the sisters. It was so fun! We got Elder Wagner, one of the senior elders, a very special gift. Haha. The night before we found a dead mouse in our house and so we put it in his gift. In the bag we wrote, "merry Christmas you filthy animal!" It was soooo funny watching him open it. The elders and us also went over to our Ward mission leader's house for correlation. I love our Ward mission leader. Him and his family are hilarious. He made us these pineapple drinks and gave us cute little Christmas gifts. The members are too nice to missionaries. Our Christmas plans include waking up at 5am to open presents with all the sisters at the Willis house, going to the VC at 7:30am for a little Christmas morning training and then we are calling home and then going to eat dinner with a member family, help set up for a wedding, and then go caroling with the elders to the less active members. Anyways, I don't too much else to say, I'll talk to some of you all tomorrow!!! Love you! Have a merry Christmas everyone! I love being a missionary over Christmas and getting to talk about the real reason for Christmas with others. It is the best. 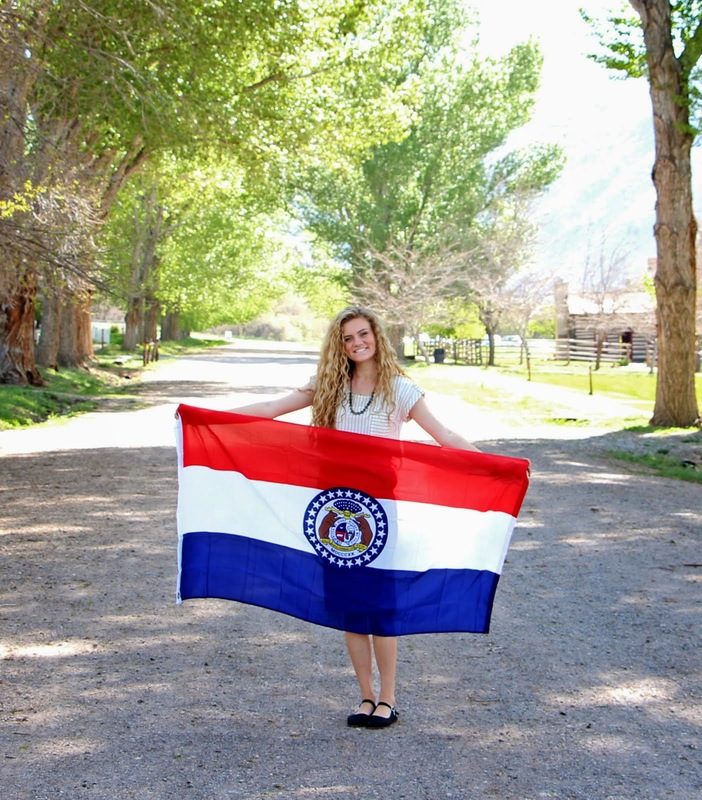 yesterday, but today actually marks 6 months since being in Missouri! Time goes by so fast!! exchange I just kept telling her how normal people were out there .. Nothing like independence that's for sure! Haha. Goodbye Inde 4th and hello Hill Park!! 1. I got transferred!! so yes, Thursday pdays this transfer. I am still in Independence and at the Visitors Center but I am in Hill Park ward! This ward is actually right in the center of Independence! If you know anything about Independence, you'll know that it gets crazier (the people) the closer you get to the center.. haha, so literally everyday is an adventure and a half. I actually just moved downstairs in the Willis house to a different room... so HUGE difference. ha. But I am now living in my own area, which is way fun! One of our amazing investigators lives right across the street from us! I am follow-up training Sister Moulton this transfer. She is amazing. We are going to miss our spunky little sister leader at the VC. She seriously changed my mission. She is amazing. I love her. 5. We went to go pick up Darlene and her kids with a member before church and we get there and oh yeah, it is POURING rain btw. So we get there about thirty minutes before church and she comes out of her apartment with 6 kids!... we barely had room in our member's car for the 5 of them.. so definitely not room for 7 of them. Her neighbor wanted her to bring her kids with her to church so we frantically called every member we could think of to help us give them a ride, we finally did and we roll into church 1.5 minutes before sacrament starts with Darlene and our crew of 6 crazy kids who are jumping in every possible puddle they see and oh yeah.. Sister Moulton and I are speaking in sacrament. haha. the craziest 30 minutes of my life. but hey, everyone got to church. everyone felt the Spirit during the Sacrament. and the Sabbath was truly a delight. 6. The Dyers. All week, I had been kind of just preparing myself to not like Hill Park as much as 4th ward.. which isn't the best, I know. I just felt that I would never love a ward as much and I felt like I wasn't really needed in that SPECIFIC area, but I was just there to finish up training.. oh man was I wrong. The Lord works in mysterious ways everyone. I am thoroughly convinced of that. This whole week has been the Lord SHOWING me that. I want to tell you all the details of everything that led up to this, but it won't make much sense, so I'll summarize and when I get home I will tell you every detail because I will NEVER forget the craziness of this. k? perfect. ok.. just kidding.. I typed it all out and it just doesn't make sense. haha ask me later about the Dyers :) but long story even shorter, I know that every missionary in the world is where they are for a specific reason. They are with their companion for a specific reason and the Lord is in charge of it all. I'm not sure what else to write about, this week has been crazy. I love my district, I love my area, I love this work. I am so grateful for our Savior Jesus Christ. He is everything. I know that He was born so that all of us could return to live with our Heavenly Father after this life and experience a fullness of joy. His plan and His gospel is a plan of happiness and joy. So a little sneak peak into the life of a sister missionaries at the visitors center during transfer time ... When you are always low on sleep ..
Ha.. I don't quite know how to describe this picture and what happened that night but I'll just say that transfers are a very exciting, nervous, sad, happy, crazy time for missionaries. My transfer prediction: I'll be going to the Liberty Jail to follow up train one of the missionaries there. But... We shall see! I am superrrr sad to probably be leaving. I love 4th Ward, I love my companion, and I love the visitors center but I'm looking forward to everything that the Lord has in store for me this next transfer. As far as this week goes... I want to first share a scripture with you all that I read this morning during studies that I LOVE. Alma 27:18. "Now was this exceeding joy? Behold, this is joy which none receiveth save it be the truly penitent and humble seekers of happiness." Shoutout to Christmas.mormon.org. Everyone go check it out and share with everyone you know this Christmas season. Back to this week: Tuesday we had our All Mission Christmas conference. It was sooo good! We had the opportunity to hear so many amazing trainings and got to see all the skits the other zones made. Ours was so fun to be a part of. It was so fun to be able to see everyone from the mission! Then on Wednesday, we had a missionary dinner that the Independence Stake put on for us. This stake is the best. It was so fun. They had a game show against our mission president and his wife and the stake president and his wife.. I think President Vest won. haha. All of Sunday, but specifically one part. We went to go contact a referral that we had set up an appointment with before church and he wasn't there, but his friend answered the door. We shared A Savior Is Born video with him and asked his thoughts on it and he went on and on about Christ and Christmas and bore his testimony to us of the Savior and then thanked us for what we do. ... this literally never happens. He then mentioned that he has met with sisters in COROZAL, BELIZE and Japan and loved how the video showed kids from around the world. (testimony to me again about the inspiration of that video. there have been countless miracles from it). and then, we asked him if he had heard of the Book of Mormon and he said yes. We asked him if he had ready any of it and he said yes! the whole thing. H then testified of the truthfulness of the Book of Mormon. He has read it from Lehi to Moroni and knows that it is true and everything!!! Sister Flake and I were just trying so hard to act halfway normal and contain the excitement we were feeling from this miracle. We both felt prompted to invite him to church that started in 30 minutes and before we could say anything, he said I just know that I need to go to church... WHHAATTT!!! So we invited him to church and he said he would come! crazy miracle. This is seriously the Lord's work. Something that we have been trying to do in our companionship is follow promptings from the Spirit more, even if they are the tiniest promptings. We have seen so many miracles from that. We snuck into Young Womens for the rest of the third hour and they were teaching one of my favorite lessons. Spiritual gifts. I loved this scripture: Doctrine and Covenants 46:8 "Seek ye earnestly the best gifts, always remembering for what they are given"
It is always such a great reminder, especially during this Christmas season, that the best gifts in this life come from God and to focus on those. I am most grateful this year for the gift of Faith. My faith is something so sacred and dear to me and I am eternally grateful to have been given this gospel in my life and for the opportunity I have now to share that with others. I love you all so much. I am so grateful for my Savior, especially during this time of year. Take moments to remember Him during this busy time of year. He is the reason we celebrate and the reason we are able to have so much joy in our lives. I can testify to all of you that the joy THIS gospel brings into people's lives in uncomparable to anything of the world.